The Adventures of Huck Finn: Synonym/Antonym Xword—Use with Bookmarks Plus! NOTE: This puzzle is meant to be used after students have read the book. 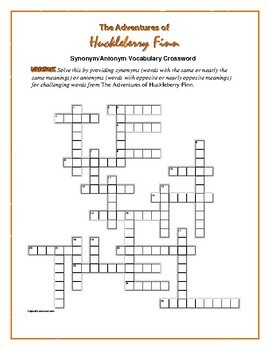 Students solve this crossword by providing synonyms and antonyms for 25 vocabulary words from THE ADVENTURES OF HUCKLEBERRY FINN. Each clue contains a vocabulary word and the sentence it is used in from the book. More challenging—and fun!—than a typical vocabulary crossword! The 25 words in this puzzle are also listed and defined on my THE ADVENTURES OF HUCKLEBERRY FINN edition of Bookmarks Plus. See product list below. 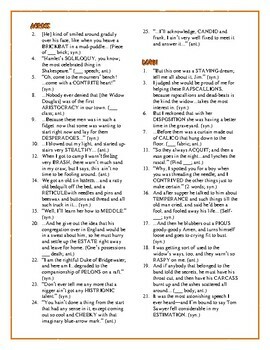 Also, these 25 words are contained in my THE ADVENTURES OF HUCKLEBERRY FINN Prereading Crossword, which includes 50 challenging words students will run across in the book. See product list below.